There is an element of camping that is all about surprises. The surprise, for example, of finding yourself eating crisps for breakfast. Or realising you haven’t had a bath for a week. Or waking up to a priceless view of a Welsh valley. And because camping can sometimes be a bit unpredictable (the moody weather, for instance) it can be rather soothing to arrive at a campsite that does exactly what it says on the tin. And that’s precisely what Erwlon does. There are no frills and no surprises to be had here, but it’s a friendly, well-maintained and attractive little site in the bosom of Wales' loveliest countryside. Erwlon seems to strike that all-important balance of being relatively unspoiled, yet still feature the clean and cosy ablution facilities that makes camping comfortable. All this should hardly come as a surprise as the Rees family have been running the site since the 1950s. Brothers Peter and Huw are now the third generation to be involved, so it’s fair to say the Rees clan know a thing or two about running a successful, well-organised campsite. 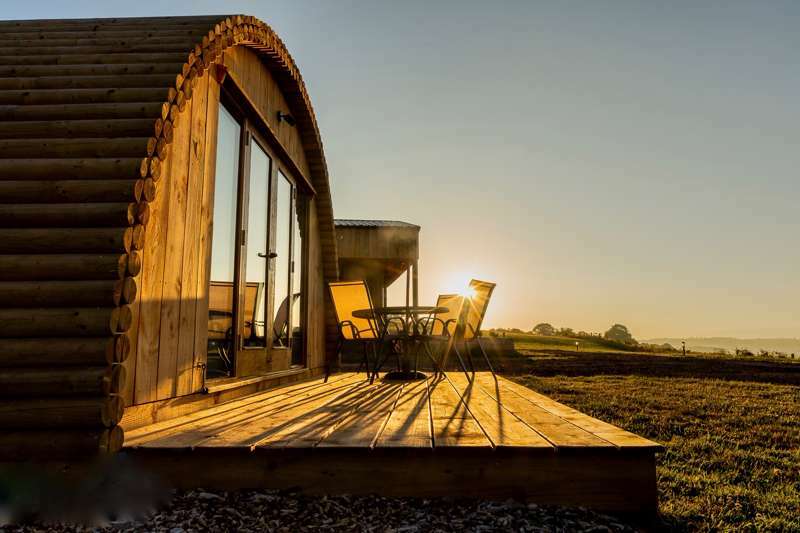 In addition to the 100-odd pitches spread over two fields (a peaceful adults-only section and a more lively family enclosure), the quartet of four riverside pods are a welcome alternative for those who like their camping with a healthy dose of luxury. With en-suite shower, a fully equipped kitchenette and fluffy duvets and pillows, these self-contained, cosy abodes means a hassle-free holiday for couples and small families. Erwlon's real selling point has to be its location. Boasting twelve impressive castles (Carreg Cennen is a must-see), Carmarthenshire comes fabulously littered with the evidence of successive cultures and kingdoms that have been swept away by one invader or another. This dizzyingly diverse county includes some of Britain’s most scenic eye-candy. Climb towering peaks, meander through lush, ancient woodlands or simply lose yourself in the solitude of the vast countryside, ‘The Garden of Wales’ never fails to cast a calming spell upon all that visit. Erwlon is the sort of place that ticks many boxes. 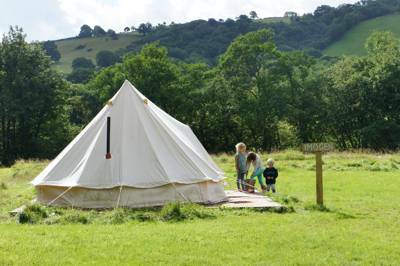 It works for those wanting to get away from it all, with a quieter, adults-only area within the site, as well as families on their holidays, sharing the same facilities, but with a more social part of the meadow where children can run wild and make friends. Those wanting the challenge of the Brecon Beacons are well catered for, as are those wanting to discover some of Britain’s finest castles, villages and coastline. 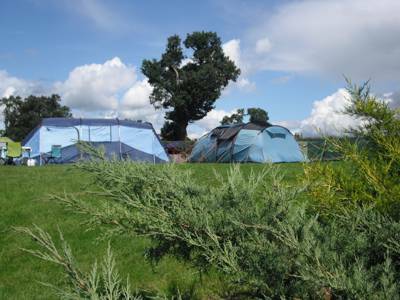 You don’t need to be eagle eyed to spot the charm of Carmarthenshire, and thankfully Erwlon, the campsite that does exactly what it says on the tin, provides the perfect base to go and explore it all. For latest availability and best prices for Erwlon, please use the Date Search above. 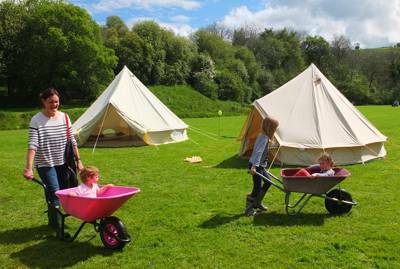 The site’s made up of 2 fields of 100 pitches, with a quieter adults-only section and a more lively family field. There are also 4 luxury, en-suite pods set beside the river. 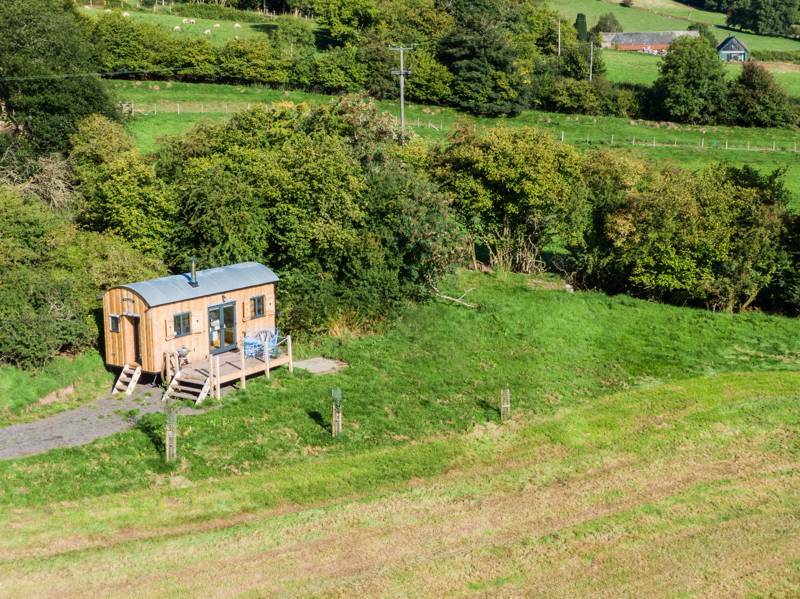 Pods sleep up to 4 and come with plenty of of mod-cons including en-suite shower room, sofa bed, underfloor heating, and fully-equipped kitchen area. A play area is located in the 'family friendly' area with swings, climbing frames and a fireman’s pole for under-12s where kids have the freedom to play while parents are able to keep an eye on them from the convenience of their pitch. Children are welcome to go (with parents) to watch the cows being milked. You could eat your lunch off the floor of any of the 5 family rooms in the wash-block. You don’t have to, of course, but these washing facilities certainly aren’t the sort that you have to brace yourself to face in the mornings. Most pitches have hook-ups, and there are laundry and dishwashing facilities, as well as drying-room and fridge-freezer. WiFi beams all over the site. Handy baby-changing facilities. Most children love dungeons, and the ones at Carreg Cennen (01558 822291) won’t disappoint. Pony-mad children will adore Cantref Adventure Farm and Riding Centre (01874 665223), where there’s an indoor play zone plus pig track and sledge rides. The Heritage Centre (01558 824226) in Llandovery has displays on local myths and legends. The Heart Of Wales Railway Line passes over the awesome Cynghordy Viaduct and then into a tunnel under the Sugar Loaf Mountains. Pick it up at Swansea, Llanelli or Shrewsbury. Campers are spoilt for choice with subterranean attractions including the Big Pit: National Coal Museum (029 2039 7951), The National Showcaves (01639 730284) at Dan-yr-Ogof and a thrilling trip to look for gold at the Dolaucothi Gold Mines (01558 825146). The trails of Cwm Rhaeadr are only a 20-minute cycle ride away. It’s a fantastic place for a day out, and the area’s drenched in history, including Bronze Age burial cairns and Iron Age hill forts. The cycle tracks are particularly good; you can hire bikes through the Reeses. Try out the pony-trekking at Pumpsaint and Llanwrtyd (01686 628200). Kids can do their own weaving at the free National Woollen Museum (029 2057 3070), or visit the splendid National Botanic Gardens (01558 668768) with its wide-open spaces mean the gardens never feel crowded. However there’s a lack of cover, so if rain is forecast - come prepared! Take a trip to the ancient standing stones of Myndd Llangyndeyrn, a Site of Special Scientific Interest (SSSI) that attracts an abundance of rare birds and uncommon invertebrates. More natural kicks await at the magnificent gardens and stately house at Aberglasney (01558 668998). You can’t visit Erwlon without a trip into Llandovery to the Penygawse Victorian Tea Rooms (01550 721727). Beneath its tinkling chandeliers you can enjoy great lunches, excellent cream teas and the best coffee in Wales. For lip-smackingly good ice cream head to Llanfaes (01874 625892) ice-cream parlour with 50 flavours of locally made ice cream. 13 miles away is The Angel (01558 823394) at Salem, while The Red Lion (01550 777357) at Llangadog also does great meals. For all you vegetarians, the Afon Duad Inn (01267 281357) in Cwmduad, offers a good vegetarian menu as well as a selection of sturdy Welsh meat dishes. The Black Lion (01545 561144) in New Quay was (amongst many, many others) a regular watering hole of Dylan Thomas. For a sunny-day treat, the award-winning Italian ice-cream at Conti's (01570 422223) in Lampeter has to be tasted. There's also a large Co-op supermarket within a 5 minute walk. 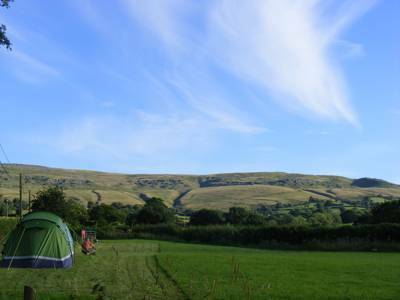 From £13 per night (low season) for a pitch with 2 people - £17 (high season), additional campers from £1.50, electric hook up £3. Pods from £60 per night. From the Severn Bridge, leave the M4 at Junction 24 and head North along the A449 until you join the A40 at Raglan. Head West to Llandovery. The site is just off the A40, 1 mile east of Llandovery, on the road towards Brecon on the right-hand side. Happily the no 63 bus between Brecon and Swansea stops outside the main gate.